Escape and unwind at our spa hotel in Bangkok. In a prestigious escape from the capital’s fast pace, exotic aromas soothe the senses and exquisite Thai design celebrates tradition. Hide away in a luxury treatment suite and let intuitive hands pamper you with ancient therapies from across Asia and Western beauty treatments. Indulge in carefully crafted journeys for optimum wellbeing at our spa hotel in Bangkok, or reserve one of our heavenly massages to enjoy by the pool or in the privacy of your suite. Discover healing traditions from Thailand, Myanmar, Laos and China. A bamboo stick massage stimulates the circulation. Stretching and pressure point techniques enhance flexibility. 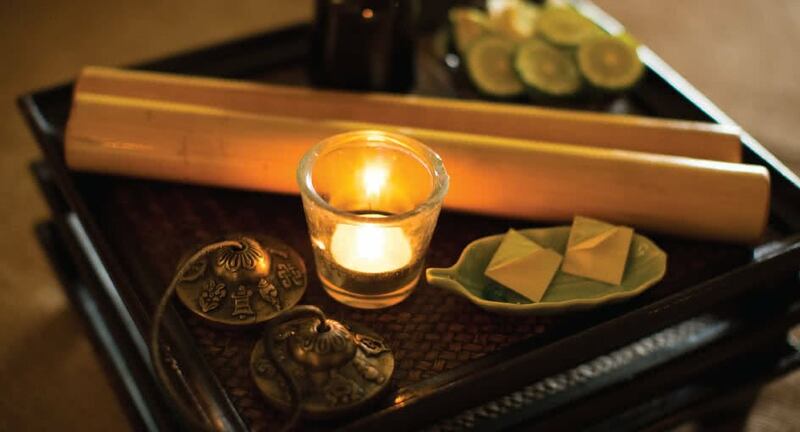 Enjoy a herbal compress and oil massage. To conclude, gold leaf is used in a mindfulness ritual. This massage stimulates circulation and deeply relaxes muscles. Revered Eastern and Western techniques are combined and our signature oil blend nourishes skin. Select your crystal-infused oil blend as precious stones surround your body. A purifying massage works to release stress and harmonise energy flow. To coax you into a deep state of meditative relaxation, singing bowls are used to begin and conclude. For an even more superb experience ask for the VIP treatment room that comes with large Jacuzzi and enjoy the incredibly soul-soothing warm bath with endless red rose petals. What a splendid holiday! I really enjoyed my aromatherapy spa treatment. One of the best I ever had. Professional staff, the room was beautiful and the therapist was expert... Can't recommend this spa enough.